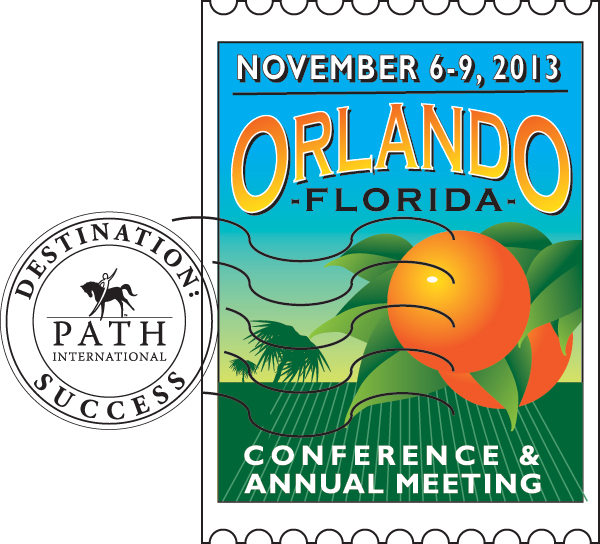 As we wrap up the 2012-2013 fiscal year, PATH Intl. says "thank you" to its 300+ members who donated this year over and above their membership. Donations--with a median gift of just $25--added up to over $45,000 to help cover the costs of instructor certification, center benefits such as the Foundation Directory, and media outreach to raise awareness of therapeutic horsemanship among the general public. Thank you! If you need help keeping records on your horse's health, PATH Intl. sponsor Bimeda/Equimax can help. Bimeda/Equimax has a free Equine Health Record available at www.equimaxhorse.com. While there, sign up for their enewsletter to receive special offers on dewormers and other products. The summer issue of PATH Intl. Strides has been mailed out! Polybagged with this issue is the much-anticipated 2013 PATH Intl. Conference Registration Book. In it, you will find the sessions schedule, hotel information, some fun things to do in Orlando, the Horse Expo line-up with the closing event at Arabian Nights and of course the registration form. Online registration is now open. The June winner of the Bimeda Volunteer Award was Brea Riley of Ride With Pride, Inc., in Staunton, VA. She has been a volunteer for more than six years, and Ride With Pride notes, "Her leadership skills and quiet confidence have matched her genuine compassion for both the horses and the participants." Be sure to check out this edition of PATH Intl. Strides magazine's "Great Idea" on page 50. Lynn Petr discusses the profitability of composting. The system she uses, O2 Compost, was a PATH Intl. 2012 Conference exhibitor. O2 Compost is offering discounts to PATH Intl. members who purchase its systems through August 31, 2013. Questions? Contact Peter Moon or call him at (360) 568-8085. PATH Intl. welcomes these new centers that joined in June! PATH Intl. has added its name to the list of supporters of the American Horse Council Welfare Code of Practice. The AHC Welfare Code of Practice outlines in generic terms what it means to be an organization that is committed to the responsible breeding, training, care, use, enjoyment, transport and retirement of horses. Signing this code is one indication of that commitment on behalf of and as an advocate for our centers.